November 14, 2014, 9:26 a.m. This week a growing rift between the Obama administration and the Federal Communications Commission (FCC) emerged on the fraught topic of net neutrality. The president came out strongly in favor of a change in the rules that would see internet service providers (ISPs) regulated like telephone companies, who are not allowed to prioritize certain customers&apos; calls over others. Currently, ISPs are allowed to charge websites to prioritize their data, and in turn restrict the speeds of others, to ensure that customers do not experience slow speeds on their sites. While legal it is controversial and rare, and the first such deal was only struck in February this year between Comcast and Netflix. YouGov&apos;s latest research shows that when Americans are asked whether ISPs should be prohibited from restricting the speed of certain content or if they should be allowed to prioritize some content over others, the overwhelming majority of Americans (77%) say that ISPs should be prohibited from restricting speeds. Only 23% say that ISPs should be allowed to prioritize certain data traffic. Support for prohibiting restrictions or prioritization of certain data, is highest among Democrats (80%) and lowest among Republicans (70%). 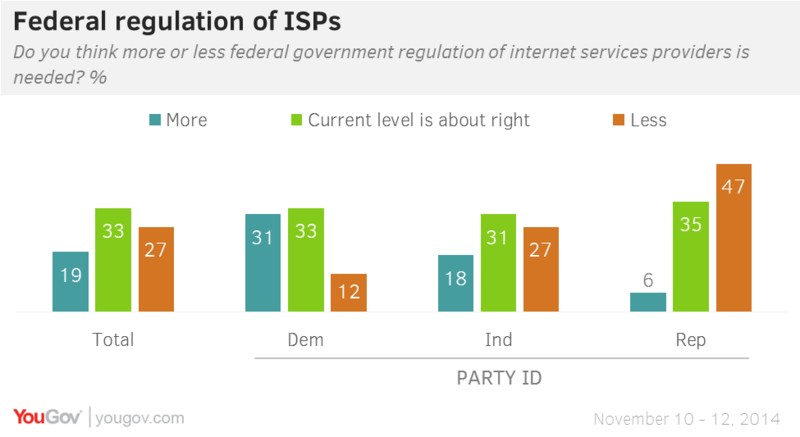 Despite this, however, when Americans are asked whether internet service providers should be subject to more regulation by the federal goverment, only 19% of Americans agree. 33% say that the current level of regulation is about right, while 27% think there should be less federal regulation. If the FCC were to regulate ISPs like phone companies, they would be subject to far stricter federal oversight. At the moment Americans narrowly tend to say that their internet service providers are giving them good value for money. 47% say that they get good value for money from their ISP, while 38% say that they don&apos;t. Republicans are overall the most likely demographic to say that they get good value for money from their ISP (59%), while Democrats (45%) are the second least likely after over-65s and people living in the Northeast (44%). Full poll results can be found here and here.